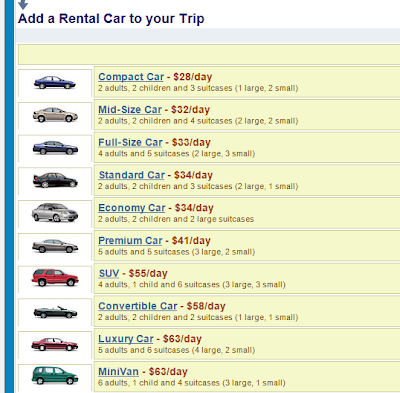 Priceline also send you an email a few minutes later, which also offers rental car upsells. Notice anything different? Thinking that people who want immediate results online might be more willing to commit at a lower price (seems counterintuitive to me). By the way, when I got around to clicking on one of the links the next day, the prices bore no resemblence to the stating figures– they were much higher. And they were consistent whether I used to online page or the email page. Good question on ‘what are they testing.’ Without knowing intent, it’s hard to intuit whether an experience like this is an elasticity test or a lack of synch between different means of messaging. 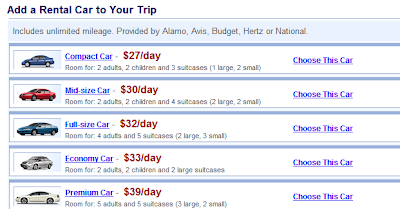 When testing the price on the clickthrough, it’s worth clearing cookies and/or using different browsers. Oftentimes if there’s A/B testing going on they’ll cookie you to ensure that, once shown an offer, you’re not shown a different one on the next visit.